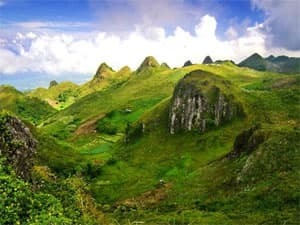 Amidst these jagged hills, lush grass and flowers is Osmena Peak - the highest mountain in Cebu. This path is a favourite for trekkers who are treated to picturesque views of the surrounding countryside and coastline, with its coral blue sea. Meet friendly locals and experience a mountain market place where local produce is sold. 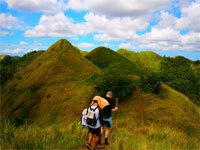 Organised trekking tours are a great way to see, and get a flavour of, the real Philippines. Trekking in Quiltinday Hills, Bicol. Maybe you fancy trekking a path up the side of a volcano. Mt. 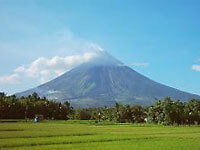 Mayon, in the Bicol region of Luzon, is one of the most beautiful, and symetrical volcanoes in the world. We offer day treks, and also overnight treks with guides. For those that opt for the two day trip, the night will be spent camping on the slopes of Mt Mayon at designated camping sites. These treks are not available when the volcano is "active". Please enquire. • Loose and cool material clothing preferably a long sleeved shirt and long trousers to cover your legs and arms. This will protect you from the heat, insects, and the blade grass. • Water - Normally your guide will provide drinking water but it is important to stay hydrated so if guests want to bring more water with them, this is very welcome. We also offer treks of Mount Bulusan Volcano, in Sorsogon, Bicol. Please enquire. One of the five highest mountains in the Philippines, this is an active volcano with a breath-taking crater. We climb through rich agriculture land, then thick rain forest, before reaching an almost lunar-like landscape around the peak. Our Mt. Pinatubo trek starts with an off-road ride from the base camp to the jump-off point where you are rewarded with magnificent views of the largest lahar canyon in the world. 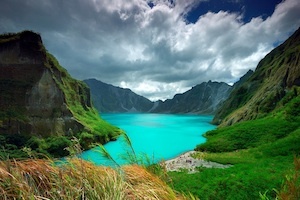 The views from the shores of the Pinatubo crater lake will live with you for ever. You will never forget this mountain's pristine blue-green waters. Trekking Mt Pinatubo means an early start from Manila, or we can accommodate you in Tarlac, closer to the start. Volcano trekking can also be organised at Taal Volcano, Tagaytay south of Manila. Trekking is also a great activity at the Quiltindale Hills, and other parts of Bicol. Let us know if you wish to enjoy trekking in Bicol. Our trek on the island of Mindoro, is within easy reach of Manila, and requires no flying. An air-conditioned bus whisks you to the port of Batangas, and a ferry ride then takes you the final stage to the beautiful region of Puerto Galera. One of the most breathtaking trails in the Philippines can be discovered in Banaue, high up in the Ifugao hinterlands. Tucked into these mountains are grand rice terraces, gorgeous waterfalls, lush forests and an ancient culture still steeped in tradition. There are treks of varying demands to suit different travellers' capabilities. The rewards are landscapes and memories etched forever in the minds of those who take this little travelled path. Rajah Sikatuna National Park, Bohol, is a haven for nature lovers and bird-watchers. Numerous species of birds, bats, and butterflies can be found there. Also Tarsier, the world's smallest primate, and Monkeys live happily. There are many paths for visitors to trek or go bird-watching. With the help of local guides, and with several routes to choose from, this is a challenging trek taking you to the peak of Mt Talinis. A short, but popular trek in El Nido is to the Nagkalit-kalit Falls, located about 14km north of El Nido Town. You'll probably travel to the start of the trel by local trike or van, along some undeveloped roads. The trek itself passes through rice fields and jungle, with a number of river crossings along the way. Your guide will point out interesting flora and fauna, and once you reach the waterfall, he'll prepare lunch for that appetite you've worked up! The water from the falls collects into a natural pool in which you can take a refreshing swim.